Here in Tasmania, we are blessed to breathe the cleanest air in any populated place and to be surrounded by a spectacular geodiversity that supports unique plants, marine and wildlife, some species found nowhere else in the world. Tasmania has the world’s biggest exposure of Jurassic dolerite and over 5,000 km of coastline with pristine beaches and rugged rock formations, created on stormy days by the temperate sea. But you don’t need to live near the coast to be connected to the ocean. The ocean regulates our weather and forms clouds that bring rain and fresh water. Yearly blooms of phytoplankton, microscopic organisms in the ocean, form the basis of life. They produce more than half of the worlds oxygen through photosynthesis, absorb human caused carbon dioxide emissions and serve as a food source for marine animals. Life evolved in the sea about 3.5 billion years ago, long before humans walked the planet. Yet, it took us only one century to over-harvest the ocean, destroy habitat at land and sea, increase the amount of carbon dioxide in our atmosphere by 25% and risk the eco-system on which we depend. No-one can point the finger, because we are all part of it. 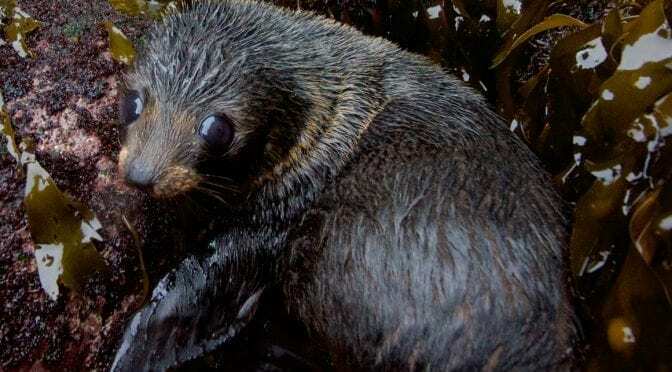 Wild Ocean Tasmania is about creating a deeper understanding and awareness. We want to take with us those people who care and wish to share an amazing, possibly life changing experience. 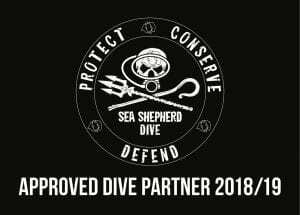 The idea behind our tours is to give something back to the eco-system that supports us and use the profit we make for ocean and wildlife conservation work. Working on the Ocean, we often come across animals, predominantly sea birds, that suffer from pollution and human impact. 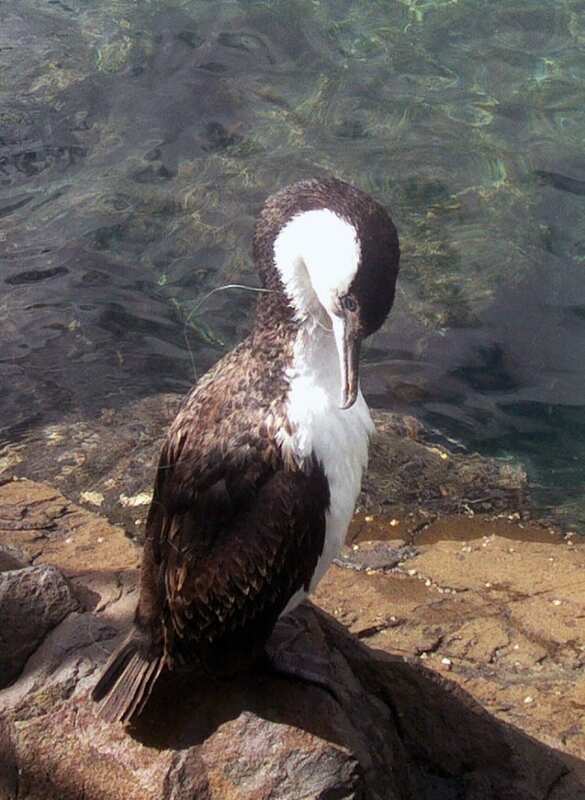 This black-faced cormorant swallowed a hook and got entangled in a fishing line. Fishing line was wrapped around the beak and neck of this cormorant, highly reducing its ability to move, hunt and eat. 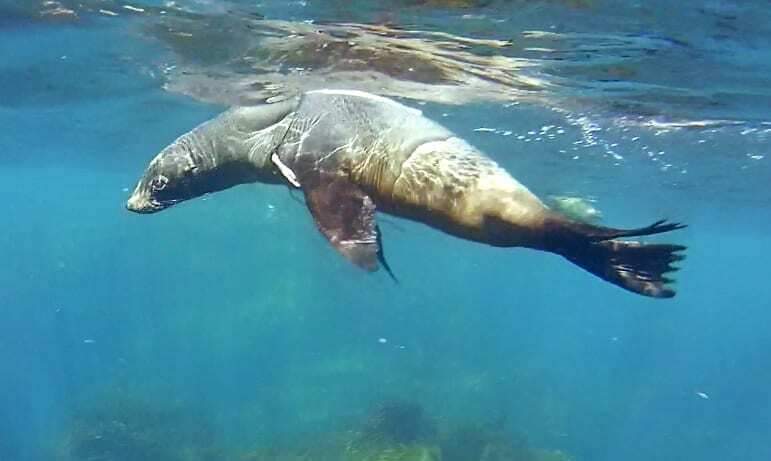 The fur seal on the photo below got entangled in a fishing net which is now deeply embedded into its skin. This fishing net must have been wrapped around the seal for a long time. 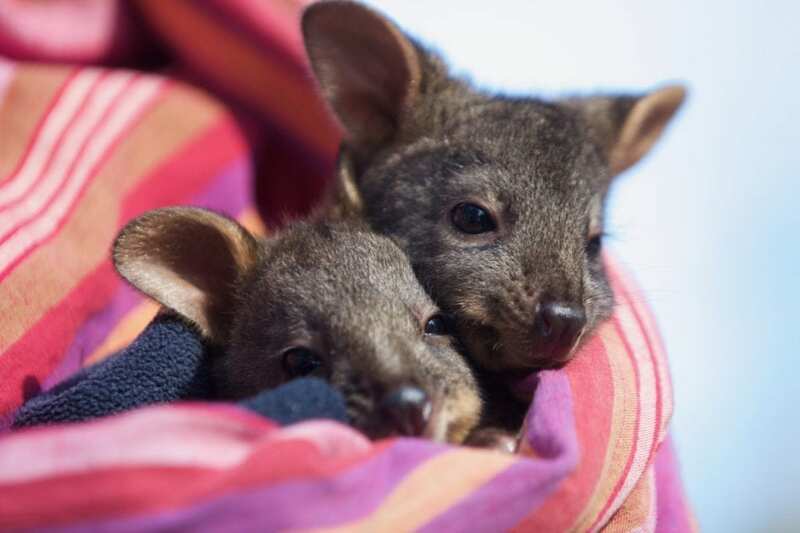 These are Lenny & Lily, two Pademelon joeys that we had in care in 2018. They were both facing the same fate that many native animals have to face here in Australia. Lilys mother was shot and Lennys mother died when they got hit by a car. These two were lucky that they were found and brought to us, but huge numbers of native animals die each day due to our lifestyle. If you are interested in reading more about this issue, follow this link to find out why there is so much roadkill in Tasmania and what we can do about it. We like to keep two animals of the same species, so they can “buddy up” while they’re in care. On the photo below, you can see Stevie, a pademelon orphan, who we found on the side of the road not far from our office. He was blind on both eyes and had a swollen lymph node. Sadly, the vet diagnosed “toxoplasmosis”, a disease spread through the faeces of feral cats. The disease either kills infected animals directly or makes the host an easier target for predators. Symptoms include anorexia, lethargy, blindness, enlarged lymph nodes, disorientation, breathing difficulties, fever and abortion. 84% of feral and stray cats tested in Tasmania were infected with the parasite. An estimated number of 75 million animals are hunted and killed across Australia each night by feral cats. To secure habitat for native wildlife, we need to control feral cats. R.I.P. little Stevo, hope your spirit found a better place! 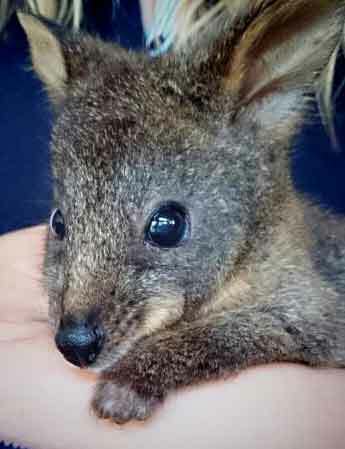 This Pademelon joey suffered from Toxoplasmosis and sadly had to be euthanised. Roodolph was found icy cold with wounds all over his little body on the side of the road, not far from his dead mum, run over by a car and scattered. He survived his first few weeks at his new home, grew some fur and we were amazed to witness his first hops. What a gift! He will stay with us until he is ready to look after himself in about 14 months. Roodolph was one of the first wildlife orphans that we took on to care for. 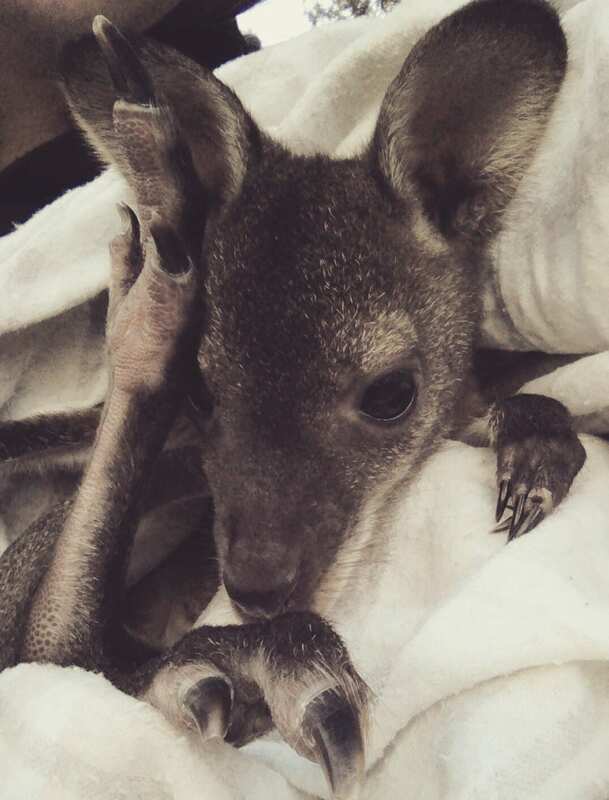 Over the years, thanks to the support of our guests, we had the opportunity to raise and release many more native animals that lost their mum. Update: Roodolph has been successfully released, followed by many other wildlife orphans. To stay up to date with our conservation work and the wildlife that is currently in our care, please follow our Instagram feed!